Shred the kidney, including the fat. Bring the orange peel to the boil in a pan of water. Remove from the heat and drain. Leave to cool. Shred the spinach, parsley and lettuce, and finely chop the apples. Add to the kidney and mix well. Mix the boiled orange peel with the ground mace and cinnamon, nutmeg, currants and breadcrumbs. Season with sugar and salt to taste, and mix together. Combine the kidney mixture with the orange peel mixture. Lightly beat the egg with the sherry and rosewater and add to the dry ingredients. Line the base and sides of a pie dish with puff pastry, then pour in the mixture. 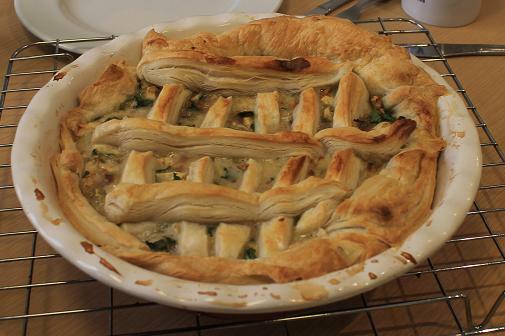 Use the remaining puff pastry to crossbar the top. Bake at 180°C for approximately 45 minutes, until the pastry is golden and the filling is cooked through. This was a challenging recipe to adapt, as the quantities given in our Cookbook were vague, and cooking times non-existent! We’ve tweaked the recipe we followed, reducing the cooking time and increasing the sugar content to result in a tastier dish with a more pleasing texture. Cut the top off the oranges and lemons and put aside. Use a zester or a sharp knife to remove a few thin strips of peel from each of the oranges and lemons. Discard the zest. Using a spoon, scrape out all of the pulp from the fruits and discard. Bring a pint of milk to the boil, then remove from the heat. Add the breadcrumbs to steep until soft. Leave to cool. Mix the almonds with the sugar, cinnamon and mace, and add to the cooled breadcrumbs and milk. Separate the egg whites from 2 eggs and beat them to a froth. Add a further two egg whites, beaten only lightly. Mix the egg whites with the brandy and melted butter, and add to the other ingredients, mixing well. 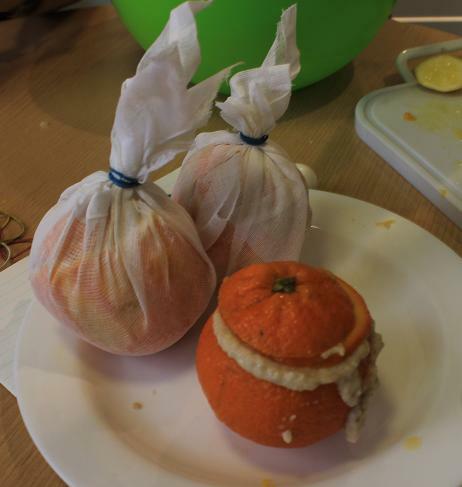 Once all the ingredients are combined, stuff the mixture inside the oranges and lemons. Put the tops of the oranges and lemons back on. Wrap them individually in muslin cloths and tie with string. Put the wrapped fruits in a pot of boiling water and simmer for approximately 15-20 minutes. These dumplings actually sound halfway decent! I’d kick up the flavor with more cinnamon, add nutmeg, and maybe even use some of the fruit’s juice & zest in the batter as well. Thanks for your comments Christina! It’s a great idea to use the citrus juice and zest in the filling and that would have certainly suited the Georgians: they were very careful about not wasting food, and oranges would have been a fairly expensive ingredient in the 18th century. We thought our version needed a touch more sugar as well to make it that bit tastier – without exact measurements in the original recipe it involved a lot of guess work! If you do try out the recipe, we’d love to know how you get on!